A buy-to-let tycoon who banned Indian and Pakistani tenants "because of the curry smell" has been ordered to ditch the policy. 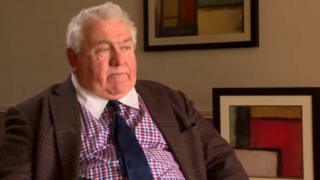 Landlord Fergus Wilson, who owns hundreds of properties in Kent, denied being racist and told a court he rents to a number of non-white people. An injunction against the policy was granted at Maidstone County Court. Proceedings began after an email from Mr Wilson to his lettings agency, asking to ban "coloured" people from renting his homes, was leaked to The Sun newspaper. Defending himself at the hearing, Mr Wilson said the decision not to rent was made on economic grounds and not based on the colour of people's skin. He described the remarks in his e-mail as "adolescent banter". Mr Wilson, one of the country's biggest buy-to-let landlords, insisted he was not racist, and has a number of non-white tenants in properties. Judge Richard Polden rejected Mr Wilson's assertion that he had been joking. He said: "I find that this policy clearly amounts to discrimination. I find that the policy is unlawful." The injunction was granted for three years and orders that Mr Wilson cannot apply a lettings policy stopping Indian or Pakistani people renting his properties. Image caption Fergus Wilson described his remarks as "adolescent banter"
During the hearing, Mr Wilson described the case as "political correctness gone mad" which could have a devastating effect on the lettings industry. Speaking to BBC Asian Network earlier this year, Mr Wilson said a property he had bought from an Indian couple cost him about £12,000 because the curry smell became a "massive problem". In the past, Mr Wilson evicted all 200 of his housing benefit tenants, saying he would rather have "migrants as tenants than people on benefits". Mr Wilson has insisted his motivation in enforcing the ban was to avoid financial risk. Speaking after the hearing, he maintained there was a "problem" with people "cooking curries" in their homes. "It gets into the carpets, it gets into the walls. You'll find that most landlords think the same. I'm here because I said it." EHRC chief executive Rebecca Hilsenrath said: "Denial of a home on the grounds of race or colour is abhorrent conduct we do not accept in today's society. "There are still deep inequalities in our country, as our race report earlier this year demonstrated, and sadly some of the causes of those inequalities were illustrated by Mr Wilson's comments over the summer. "Today takes us one step closer to a more equal Britain."